In a medium bowl, mix the 2 & 1/2 cups all-purpose flour, 1 cup sugar, 1/2 cup cocoa powder, 1 tablespoon baking powder, & 1/2 teaspoon salt. in a separate bowl mix 1 cup milk, 2 large eggs, 8 tablespoons cooled melted butter, & 1 teaspoon pure vanilla extract. Mix with a spoon until combined. Gently mix in the 1 cup raspberries & 1/2 cup dark chocolate chips until evenly dispersed. Pour the double chocolate raspberry muffin batter into each tin 3/4ths full & top with a few extra raspberries & chocolate chips if desired. 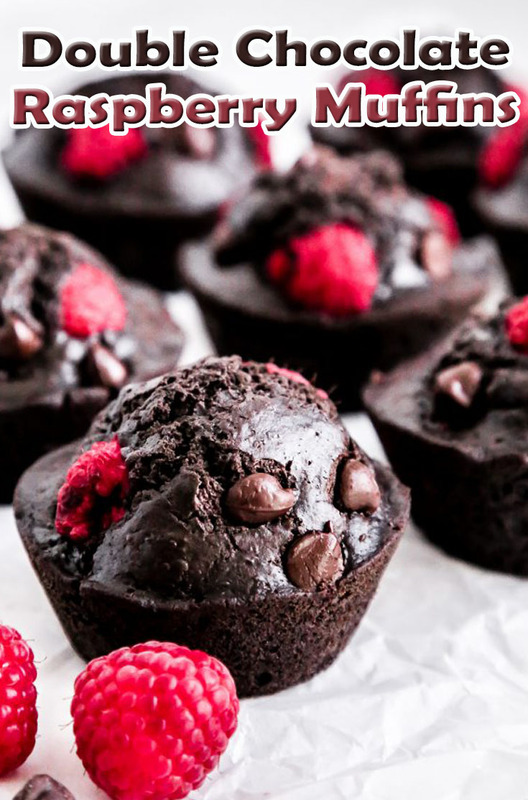 Bake your Double Chocolate Raspberry Muffins for 20-25 minutes.